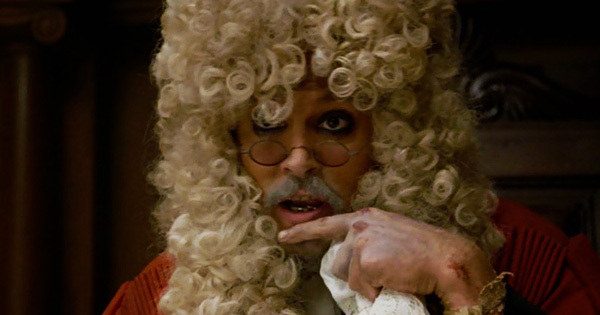 Pirates of the Caribbean: On Stranger Tides (2011), the regrettable Kingdom of the Crystal Skull of the Pirates anthology. MY CALL: Among the Pirates anthology this was clearly the worst. Entertaining, but nothing I’ll choose to watch again. 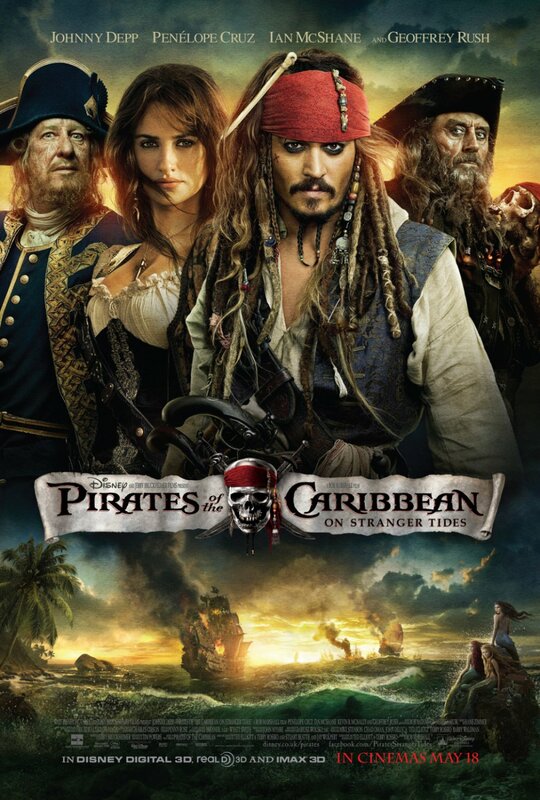 MORE MOVIES LIKE Pirates of the Caribbean: First things first: you better see The Curse of the Black Pearl (2003; the BEST of the franchise, in my opinion), Dead Man’s Chest (2006) and At World’s End (2007) before you see this, if you even bother to see this fourth installment. I’d suggest skipping this and going straight to Dead Men Tell No Tales. People who enjoy this franchise likely prefer grand-scale worlds as found in the Harry Potter films (2001-2011), The Lord of the Rings (2001-2003) and The Hobbit trilogies (2012-2014), Jurassic Park (1993) and The Matrix trilogy (1999-2003). I’d also strongly recommend the STARZ series Black Sails (2014-2017; 4 seasons). So much has changed over the course of four Pirates movies. 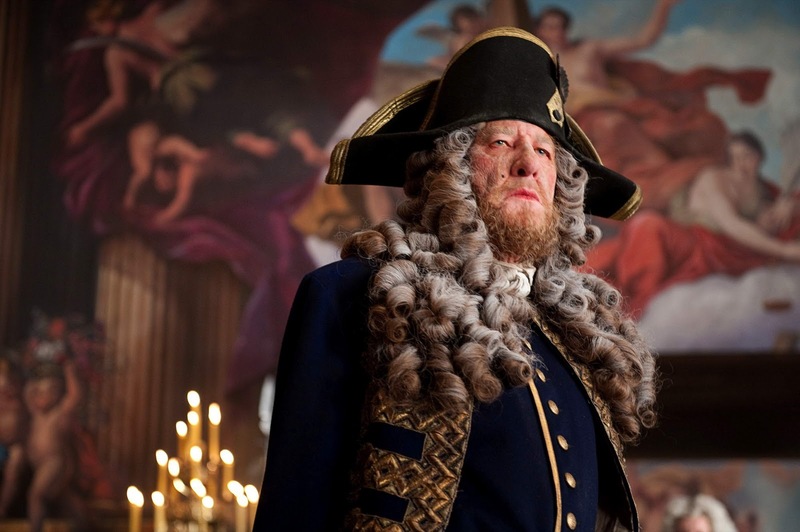 Now pledged to the crown, we find a bewigged Captain Barbossa (Geoffrey Rush; Gods of Egypt, The Warrior’s Way, The King’s Speech), peg-legging about complete with make-up, explaining how he lost the Black Pearl. 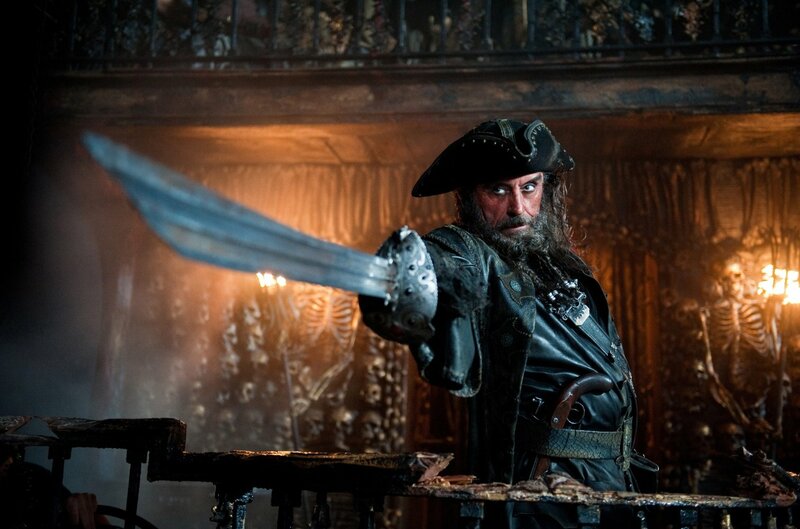 Much as did Norrington in parts 1-2, Barbossa’s allegiance his shifted dramatically. But we’re used to that in this franchise, aren’t we? 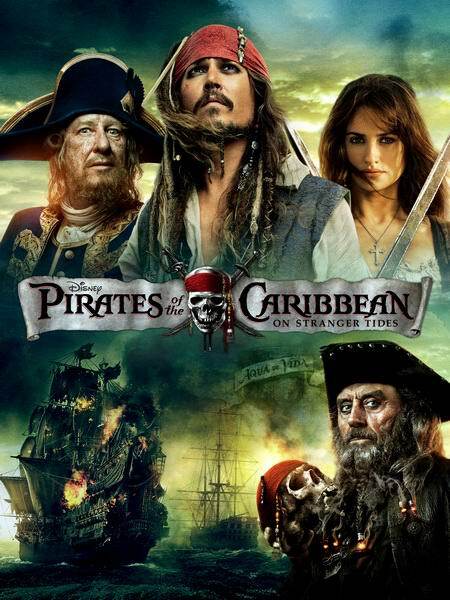 Picking up where At World’s End (2007) left off, Captain Jack Sparrow (Johnny Depp; Blow) endeavors to find the Fountain of Youth, and he must do so before the Spanish find it first! Jack needs a ship, and finds opportunity when rumors of “another Jack Sparrow” (an imposter) signing on new crew members. This imposter is Angelica (Penelope Cruz; Blow, Vanilla Sky), Jack’s ex-girlfriend and the first mate of the sorcerous Captain Blackbeard (Ian McShane; Jack the Giant Slayer, John Wick 2). Interesting how undeath seems to be a theme throughout the Pirates films. Rumored to have returned from the dead, Blackbeard has created “zombified” crewmen and wields a magical control of his ship. To reap the gifts of the Fountain of Youth requires a mermaid (Astrid Bergès-Frisbey; King Arthur: Legend of the Sword). Only one problem: mermaids are ferocious man-eaters. The mermaid attack scene was outstandingly fun. Director Rob Marshall (Chicago, Memoirs of a Geisha) picks up the fourth installment of the Pirates anthology after Gore Verbinski’s original trilogy. So, what does that mean for us? Well, nothing good really. Our senses are no longer dazzled by Verbinski’s realization of grand scale. And this loss of scale is not limited to the cinescapes, but the execution. Jack’s stunt-rich shenanigans are fine, but seem just mildly entertaining iterations compared to his past films. And whereas the swordplay choreography itself was on point, the overall scenes and fights lacked impact. Moreover, whereas many ship sets looked excellent (as is the mega-budget franchise standard), several other sets (e.g., the caverns) felt as if they spawned from a far lower budget film—certainly not the product of a $250 million blockbuster! It’s as if we set up our coolers and lawn chairs at dusk awaiting fireworks only to be met with sparklers. And speaking of sparklers, this was the first Pirates film that had no significant ship-to-ship combat! It doesn’t help, for my taste anyway, that everything seems “sillier” in this sequel. We have silly disguises (many times over), silly balancing gags (like a teetering ship), silly escape gags (like climbing a tree backwards and sling-shoting oneself), silly maneuver gags (like tying up 8 men at once by running around them with a rope like a cartoon character)… is this to make this more kid-friendly? I even had to watch a completely forced man-mermaid love connection transpire, boasting no more chemistry than that between a man and an actual fish. Where’s Will and Elizabeth when we need them? Their love was credible. On the other hand, the plot is not overly complicated. The double-crosses were few, and the story was followable without having seen The Curse of the Black Pearl (2003) and Dead Man’s Chest (2006), like yesterday, in order to have a clue what’s going on—which was the case with the confounding At World’s End (2007). Another perk was that, as usual, the ships look fantastic. I always loved how every captain’s ship had as much personality in appearance as the men crewing them. But, with that, another downer: we lost many members of the crew we had come to love… and the tentacled effects we came to love! Oh, right, and why was this Fountain of Youth plot even important??? There was really never a “good” reason to find the fountain outside of greed. Ergo, no urgency for us to care. Overall, this was a dud. It’s a huge budget popcorn movie and I didn’t exactly hate watching it as a standalone film—unlike the overly prequel-reliant parts 2 or 3—but this was the Kingdom of the Crystal Skull of the Pirates anthology. We all know it’s there, but none of us want to acknowledge its existence after we’ve seem it. I’d suggest the next time you watch the original trilogy, skip to Dead Men Tell No Tales (2017) and ignore this one. ← Pirates of the Caribbean: At World’s End (2007), revealing everything you ever wanted to know about Davy Jones and the Flying Dutchman.